The city’s notice on one of the boarded-up old houses at Fourth and Calapooia. 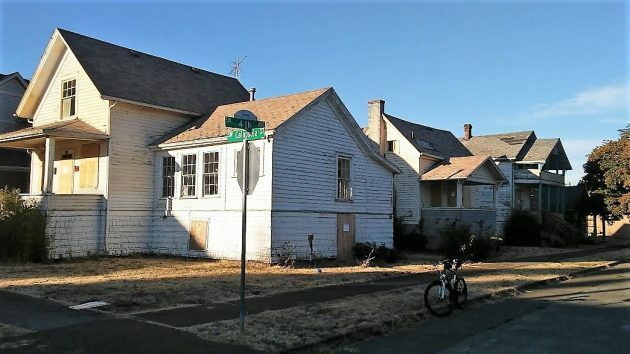 That’s because the Albany Landmarks Advisory Commission Wednesday voted 4-1 to disapprove a request to demolish the structures, at 331 Calapooia, and 525 and 533 Fourth Ave. S.W. 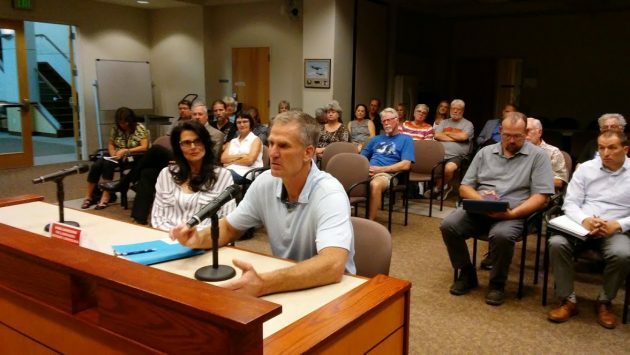 The decision means the owners, homebuilders Mark and Tina Siegner, have to wait until July 9, 2019, before they can legally raze the houses. That’s a year after they filed their application for permission to demolish them. Mark said they’ll consider whether to appeal to the city council. In testimony Wednesday, he vigorously — and to my mind convincingly — demonstrated that renovating the houses was not economically feasible. Landmarks members Keith Kolkow, David Abarr, Jolene Thomson, and Larry Preston voted to deny the Siegners’ application. Bill Ryals, the chairman, cast the only no vote. Seven people spoke in support of the request, including neighbors who were looking forward to ridding their street of the blighted houses and to the construction, in their place, of new rental housing. Two others spoke against the request. The year’s demolition delay provided for in the city code is intended to allow alternatives to be explored. Maybe somebody might offer buy and save the houses. But Siegner told me they didn’t buy the property to sell it. For the background on all this, typing “Siegner” into the search function on this site will take you to the several previous stories. Mark and Tina Siegner at Wednesday’s hearing before he Landmarks board. The three houses at issue: Their demolition will be postponed. Tell these idiots on the board to pay for it then, and not with tax payer money! An oversight group with minimal skin in the game requires a property owner to invest in a project with negative return. The replacement of these properties by new compatible properties will add to the value of all the other historic properties in the neighborhood. Isn’t it remarkable that anyone, anywhere, ever wants something built nearby, especially rental housing? 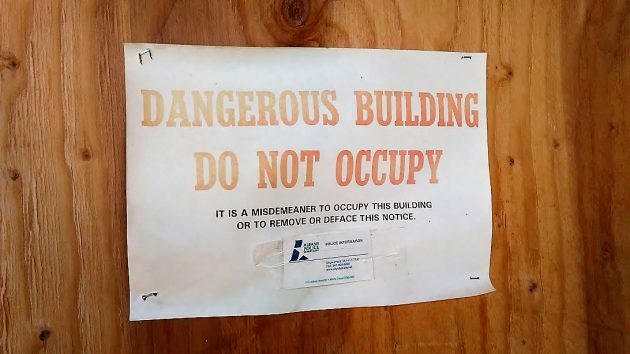 Those buildings must be really decrepit. To my eyes, they also seem ugly and uninteresting. By the way, there’s a house in Corvallis in a similar legal siruation, search “Henkle House” if you’re curious. The question that needs answering is, why are 3 trashed buildings viewed as historically significant? What Albany needs is more blight, more fast food joints and strip malls. The very idea of a Landmarks Comission is anathema to progress. Albany Landmarks Advisory Commission members are probably the type that would pull the wings & legs off of flies when they were kids. Now they do it financially to others. What REASONABLE expectation do they REALISTICALLY have that the buildings won’t be razed? It absolutely amazes me how out of touch some people are. This WILL come up next Wed at the regular Council meeting at 715 pm, I have spoken to 2 other Councilors, (sunshine laws keep me from speaking to any others about this) the 3 of us are in agreement that the houses should be torn down… So I will bring it up during business from the Council and we will discuss getting this particular monkey off of the Seigners back. Rich Kellum, the City of Albany is pretty lucky to have your conservative voice on their council. This is such a crazy issue. Shouldn’t be any questions about ridding the area of those ugly houses. Never really thought of historic homes as a left-right issue… interesting. Some might consider Kellum a welcome perspective. Others not so much. A few correction on assumptions here. These 3 properties are listed with the department of the interior as contributing historic that protects them by federal law. Mark Siegner a 30 year contractor purchased all 3 properties for 85k. According to the DH article from 9/1/19 “At the time Siegner said, he thought the three homes could be restore. Then he went inside”. So someone with that experience didn’t inspect the houses prior to purchase?? Wow that’s absolutely amazing. He didn’t propose or submitted to the city plans for what would go there so criteria 3-5 is null of ADC 7.330. His attempt with CARA was 500k and 500k Grant with 400k of his own money. Cara requires a 50/50 match to help anyone. So he was denied. He did not attempt other grants or help with the state. He’s made no attempt to look into moving the houses. The corner house at 4th and Calapoolia is known to be 1858 making it a homestead house which of less than 200 are still standing according to Restore Oregon. This makes it the second oldest house in Albany after the Monthieth house. So it is of historic significance. The estimates to restore all 3 houses had very rough estimates all the extract same. Some of the estimates looked bloated. 6k for counter tops and 5k for light fixtures. I believed these to be bloated to convince people it isn’t cost effective. Estimates have been brought up many times during CARA meetings. Since he’s a contractor I’d expect some bipartisan estimates and ones that would be specific to each house. His credibility was lost on me for the above reasons. He wanted to raise the houses to make the basements a living space thus increasing square footage. So he can get more for the houses. He didn’t have a estimate on not doing this to get the restoration cost down. He isn’t open to saving some. He just wants all 3 gone. I believe when he purchase these houses his intent to demo them and then discovered what was invloed. So a contractor doing business in Albany for 30 years was unaware. Food for thought. The 7 people talking on his behalf were obviously family members and friends. Even a lobbyist spoke on behalf. Again credibility was lost. If he does build on this property so “this monkey” is off his back he will need to come to Landmarks again to get new construction review. Amazes me contractors don’t know how things work. The purpose of a stay is explore alternatives to demolition. I know this will not occur based off what I read and heard last night. Wait and see at this point. Thank you David Abarr for your insightful comments on the historic houses on fourth avenue. To me, homes that have survived for over 120years are indeed historic. Our CARA urban renewal plan is based in large part on the repair and renovation of our historic downtown. Some like the idea. Some don’t. I’m pleased when various people, particularly out-of-towners comment on what an interesting, neat old downtown we have here in Albany. As to these poor, abused houses, I see CARA as the means for restoration of buildings that need some help to make them viable. Mr. Siegner made an unfortunate attempt to get CARA funds. He showed no plans, drawings or examples of similar projects. City staff turned him down. Hopefully he or someone with more insight can bring CARA a better plan. A few years back we had a significant water leak. The experts (well established, respected company) came out, crawled under the house, poked their stick thingies in the backyard…estimated that the repair would take approximately three hours. We were without water for three DAYS…the problem, once they started digging, turned out to be more extensive than they realized. Maybe because of his experience, he did feel he needed to physically inspect the inside…he undoubtedly had photos, appraisal reports, etc. But as illustrated above, even the experts aren’t perfect. As for the estimates being bloated…maybe, maybe not. My BIL who is a contractor owned a historical house…it wasn’t cheap because it’s not like you can go down to Home Depot or Lowes for the required countertops, light fixtures and windows. If anyone, including the City thinks they can do better, then they need to put their money where their mouths are…buy the property from the Siegners for what they paid plus 10%. PS – How ‘historically significant’ is a house really if you are having to replace 90% of it, which probably includes the foundation? As I’ve spent the last 11 years restoring a home in Hackleman as well. Had the numbers been more specific and being a contractor for 30 years his numbers seemed pie in the sky having very rough numbers for all 3 houses. I assumed he wanted to replace all windows. Looking at the corner property they look mostly original and restorable. Had he gone to the local window restoration place and gotten a real estimate my opinion would have been different. I fully understand what’s involved in old houses. The criteria was having every avenue taken to save these properties. Restore Oregon only lists endangered by some one who presents it to them. Which I will be doing. And ask the question of how much remains original of the Monteith house. That non profit has painstakingly pieced together the home. And the foundation on this house was never inspected to the point of real definition of condition. I found his argument of the criteria wasn’t met. As did the city. I point out that the middle word in the committee is “advisory” not dictator. One can argue the merits of historicity. Some folks care. Some don’t. The only real question of merit is; who gets to do what with the property? Is it the legal owner, or is it a clutch of self-selected historians who are mightily convinced their beliefs outrank all others. In the end, since the homes in question are held privately, the thousands of interested and utterly charming history buffs currently prowling Albany in search of an Historical High only reachable by entering and examining the sagging structures are rebuffed. If the Landmarks Commission is truly interested in preserving Albany history then perhaps they ought pony-up the cash necessary to complete their Elysian Dreams. However, the 3 hallowed homes in Albany do not appear to be of much concern to the fine folks at Restore Oregon. There may have been a bit of hyperbole in Mr. Abarr’s assessment of the alleged direness of this situation. Restore Oregon only lists currently what has been brought to them. As a grassroots organization that’s how it works. The attention these properties gained of recent has brought the corner lot into the light of what is is. Similarly the house directly across from me was discovered a few years back during rehab to be the original Hackelman homestead house from the 1850s. Research pre Sanborn insurance maps pre statehood is very difficult. Not impossible. This town called hub of the valley was very significant to the expansion of the west. Like some pointed out some care and some don’t. But I know this city is vastly better since I moved here in 2002. Those that care have made it a better place. Again the cup empty crowd will tell you they don’t like living by here. I will die here. I love Albany. It amazes me that appointed (not elected) commission members like Abarr think they should have the power to dictate what private property property owners should do with the houses they own. Abarr’s default reaction is to denigrate the private property owner. And Abarr tries to hide behind a bureaucratic assertion that these blighted houses are somehow “historic.” He is blind to the fact that some “historic” houses require necessary destruction given they have become blighted and can’t be economically preserved. These houses serve no “historic” or economic purpose. But as mentioned in a previous Hasso blog, “economic sense” is a concept that escapes appointees like Abarr. “Crazytown” is a term we hear often about Washington DC. But it also applies to Albany. And appointees like Abarr are the sycophantic contributors to the craziness. The sad part is he seems blind to these truths. Abarr should resign. He is an embarrassment to the City of Albany. Wow hilarious. The federal government says they are historic. The department of the interior says so. Come to a Landmarks Commission meeting so you can learn about the mission of the commission. It’s also available online as well. The city isn’t in the business of private property ownership. Pretty basic stuff someone who seems to live trolling online. I’ll be on the commission as long as I can still walk in the door. I appreciate the motivation. If you mean Donald Trump’s Interior Department, then you’ll have to pardon me whilst I gag. The folks who get chosen to sit on this commission are self-selected due to their predilection for all things historic. That is all well and good until you start talking about money. Abarr says the Commission is not in the business of owning private property. I get that. Too much risk in ownership. Some government agency might come along and tell you what to do. What Albany’s Landmark Commission needs is more guys like Shadle and Kellum. They’d slow the freight train down. I am sure you will some how find fault in how the commission operates and the purview the state has over said commission. Here are some links to enlighten those unaware. The purpose of this commission is to “safeguard the city’s historic and cultural heritage; foster civic pride in the beauty and noble accomplishments of the past; protect and enhance the city’s attractions; strengthen the economy of the city and property values; and promote the use of historic districts and landmarks for the education, pleasure and welfare of the people of the city.” The LAC maintains historic property records, recommends historical designations, coordinates preservation program planning, and recommends rules and regulations necessary to carry out its purpose. It reviews applications for new construction, exterior alteration, additions, and demolitions for the buildings in Albany’s four National Register of Historic Districts (over 800 buildings) as well as roughly 80 additional buildings outside of the districts on the local historic inventory. Gordon can’t come to the meeting very easily. He lives in North Carolina. The homeless will have a place to live for the winter now. There is no reason to bad mouth David Abarr about his comments. He has many years of experience in restoring old houses (do you?) and probably knows many of the costs to do so. He was not the only member voting no. The staff report also recommended that the request be turned down. The historic districts where approved by the Federal government on Feb.7th 1989, The city of Albany is a Certified Local Government under the laws of the National Park Service historical program. There has some comments about the Monteith House Albany’s first frame built house. The Monteith House was completed in 1850. The house was a dilapidated run down apartment house in the 1970’s. The owner offered it free if it would be moved. It had already been moved from facing Washington to facing 2nd St. The city after hearing from many citizens decided to buy the land it was sitting on. A group was formed called the Monteith Historical Society to restore the house. A grant was awarded from the Federal Government to start the process. The grant money available through the Federal Parks Service comes from off shore drilling monies. The city owns the house but it has been managed by the Society since the beginning of the restoration. Through many fundraising efforts the house has been restored and opened to the public for tours etc. There was a comment about what is still left of the original house and the answer is most of it is original. We have a notebook of what it looked like during restoration. The house has no foundation and sets on logs and large rocks. The wiring was redone (yes it has electricity and some plumbing). A few years ago we had a heat pump installed with ducting to keep the house at the same temp. to protect the Monteith treasures. I would say that if the Calipooia house was built in the mid 1860’s it could be a available asset to the Montieth District. The Monteith Society sponsors 2 historic homes tours a year that bring many people to our community.. Some people come from Eugene by train to visit the parlor tour in Dec.which is the most popular. It is interesting listening to the owners about all the things they had to do to their houses to preserve them. If you don’t want to follow the rules to live in the historic districts don’t buy a house there. Folks keep bringing up the Monteith house as an example to follow. The provenance for that house is in the name. Without that name, it’s just an old house. There’s been no mention of a provenance for these buildings other than age. The Commission’s charter allows for common-sense decisions as to whether a project benefits the City. The charter doesn’t require that everything old be preserved. I can’t believe all the trolls that are personally attacking David for following city code. And the code is there for a reason. Some of us actually chose to live in historic neighborhoods. for all those who take exception to Siegner’s cost estimates- these numbers are not out of line for a high end renovation, which is exactly what we need in that location. I’m still vexed by the extremely shoddy workmanship and materials the city has allowed one block down third at the canal. The commission even voted to let the out-of-state investor utilize vinyl windows while it holds private homeowners to a higher standard. Instead of attacking the Siegners, let’s applaud them for taking on these eyesores.